If you devote long hours to beating computer games, supporting your forearms and wrists with an ergonomic mouse is crucial in the fight against Repetitive Strain injuries and Carpal Tunnel Syndrome. An ambidextrous ergonomic mouse is especially handy for gamers but rare to find since most ergonomic gaming mice are often meant for right-handers. Worry no more about this, as our game review today will focus on best ergonomic mice for 2019 that can be used by both right and left-handed gamers. Aside from Logitech Prodigy G203’s RGB lighting, this mouse has a plain shape that makes it look more like one you can use for office work than gaming. It has been made with an ambidextrous design that makes it handy for both right and left-handed users. Additionally, Logitech G203 has 6 programmable buttons, which is a number more than you can easily find on a normal mouse. The scroll wheel of Logitech G203 is a hair wider and has a more textured rubbery surface than typical scroll wheels. Logitech Prodigy G203 has a DPI of 6000 and a gaming software that allows you to customize its sensitivity levels. It is easy for you to set between one and five active levels to cycle through from a DPI of 200 to 6000. The most remarkable downside about Logitech Prodigy G203 is that although it has been styled to be an ambidextrous mouse, it does not have thumb buttons for left-handed people. The plastic shell of this mouse also feels slippery, and you may find the right and left buttons too mushy and loud. Like most high-end mice, Logitech Prodigy G203 has onboard memory that allows you to take game settings from one PC to another that you game quickly. This feature is not available in many budget mice, and is hence a plus for Logitech G203 as it only retails at $27. 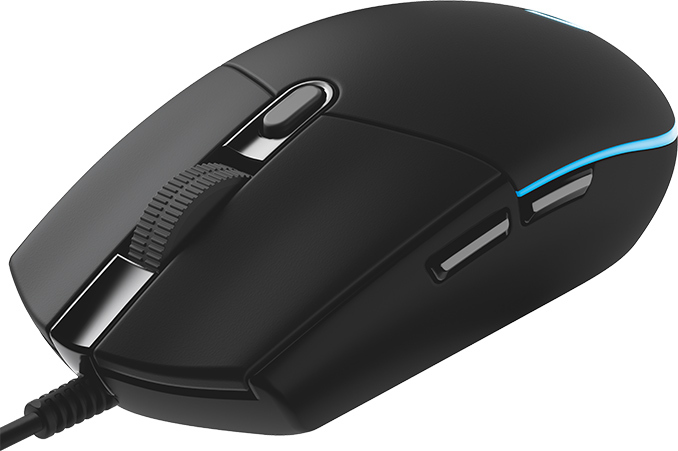 For more features about this mouse, you can check out our Logitech g203 detailed review. The Logitech G903 has been made with an ingenious charging technology that wirelessly charges the mouse through its pad, and comes with everything you could need from a left-handed gaming mouse. Other features are a 36 hours battery life without RGB, and 24hours battery life with RGB, five custom profiles, a response time of 1ms per 12,000DPi, and a DPI switching button. Another amazing feature is 10 grams removable weight that allows you to weight the mouse to feel better. A high-end mouse, Logitech G903 has up to 11 buttons which are enough for any purpose. You can customize these buttons. Logitech G903 was designed with left-handed persons in mind. Its buttons are easy to orient to the side you want in seconds since they are magnetic and pop on and off. Whether you prefer claw, palm, or fingertip grips, G903 makes it possible for you. The downsides to this mouse are that it is quite costly and that its Powerplay mousepad is sold as a separate package. As a left-handed gamer, one of the hardest features to find in a mouse is a left-hand grip. Razer Ouroboros gives you this. It has an ambidextrous design suitable for left-handers but actually allows you to easily swap out the grip for the specific left-handed grip you need. The Razer Ouroboros is shipped with a rechargeable battery, but one AA battery lasts about 12 hours of playtime. With its 11 programmable buttons, you can use the Razer Ouroboros to play demanding games, and even customize these buttons the way you want. Like many other Razer mice, Razer Ouroboros is shipped with a Synapse 2.0 software that allows you to customize the mouse efficiently. Razer Ouroboros has an 8200DPI 4G sensor and a response time of 1ms. You can use this mouse to play MOBA and FPS among a wide range of computer games. The biggest drawback to Razer Ouroboros is its high cost. Its quality is fantastic though, and it will give you a superior DPI as well as impeccable charging features. Mostly, you will be paying the relatively high amount of money due to the unique grip options, and the many button configurations.